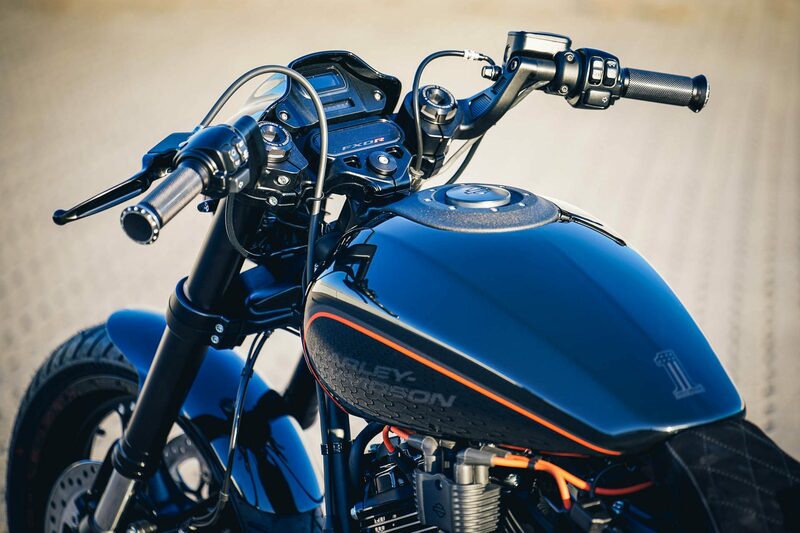 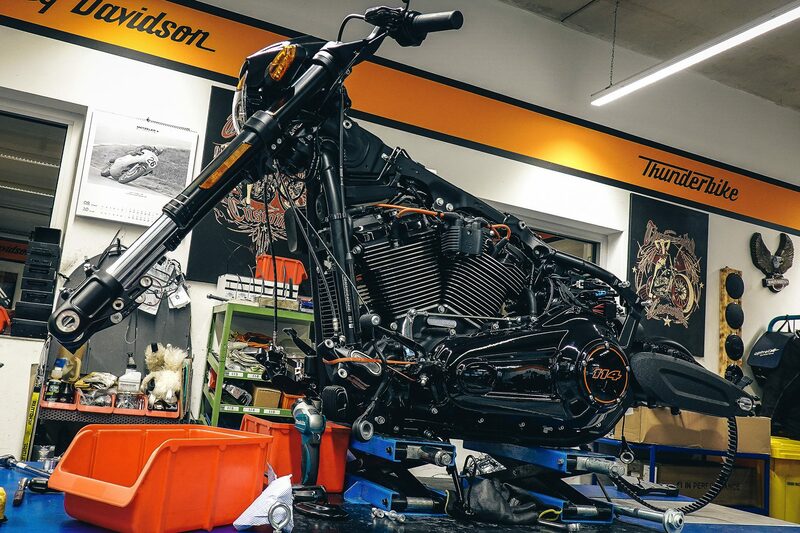 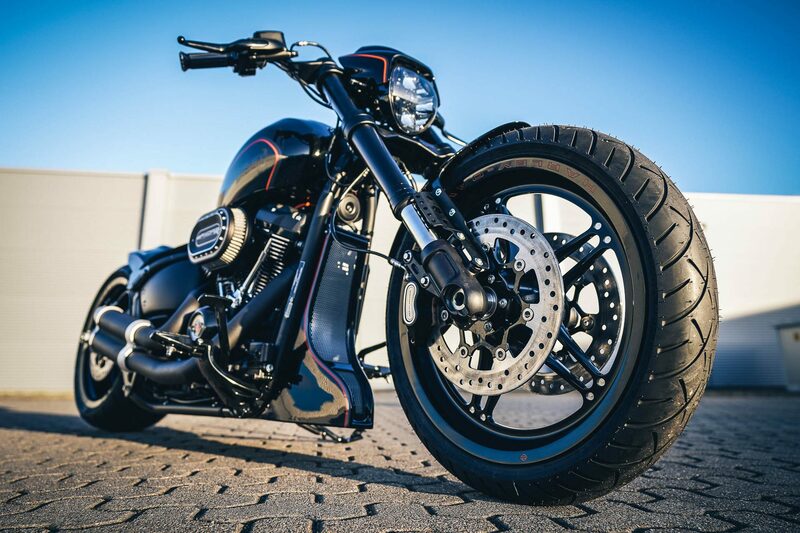 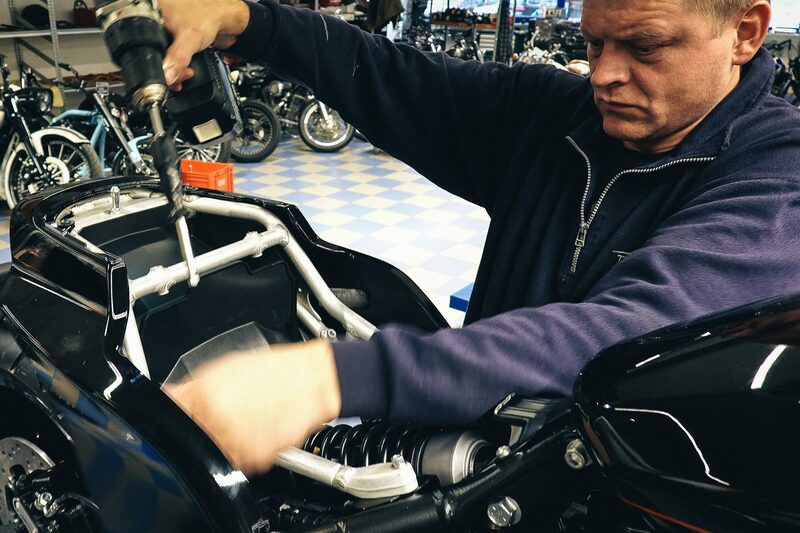 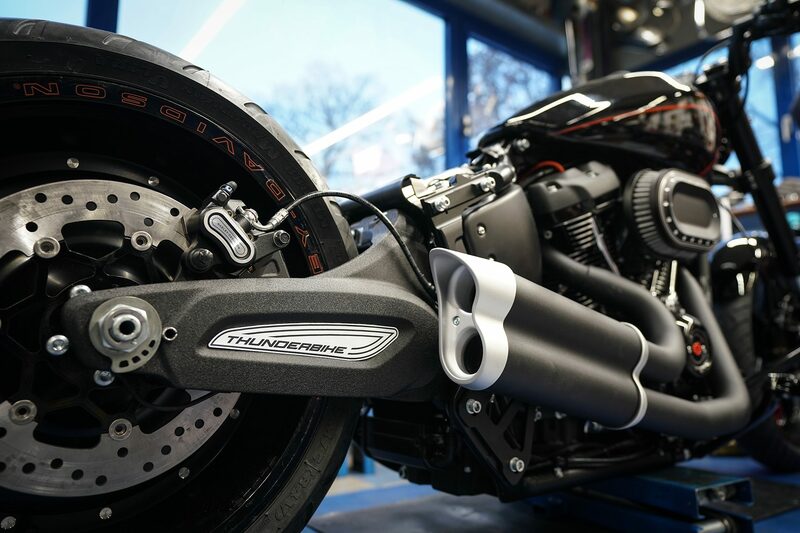 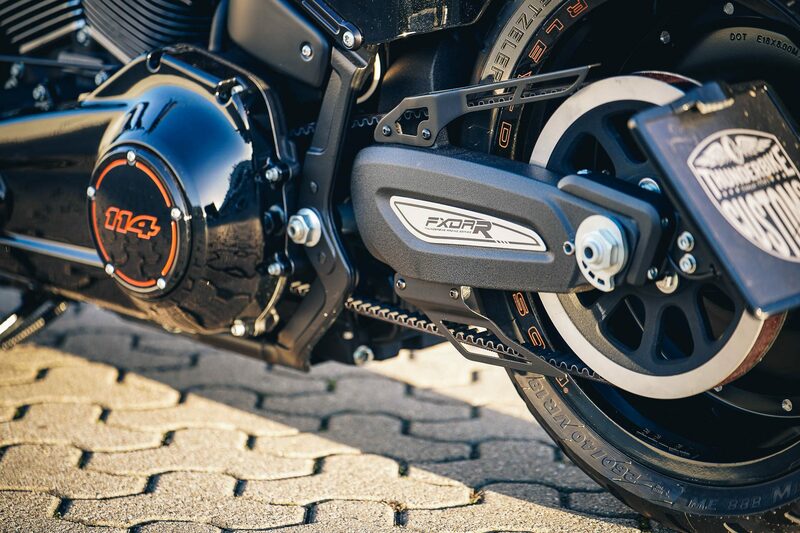 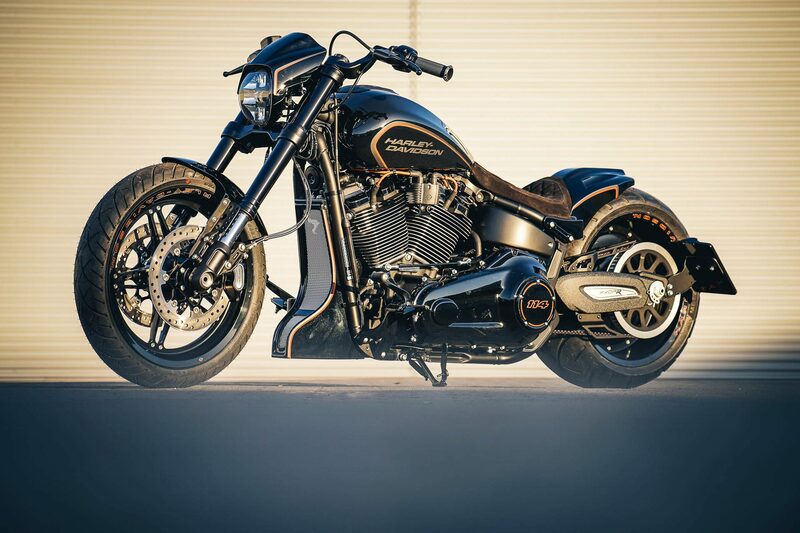 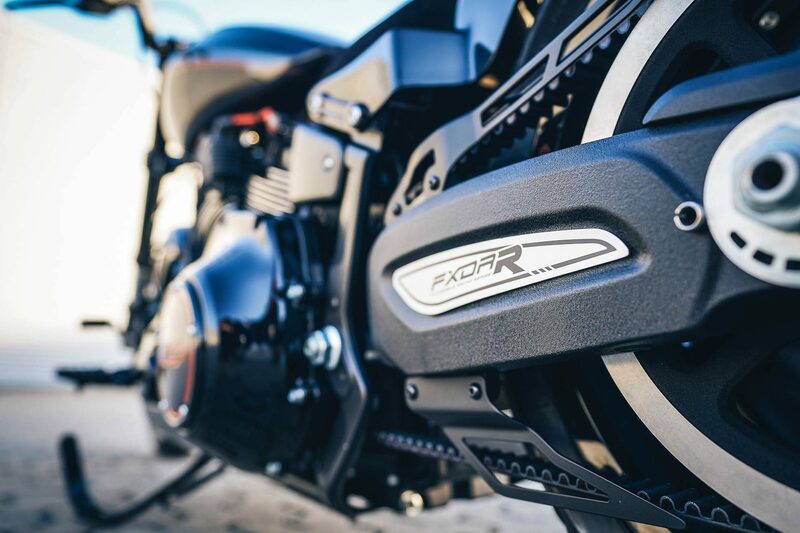 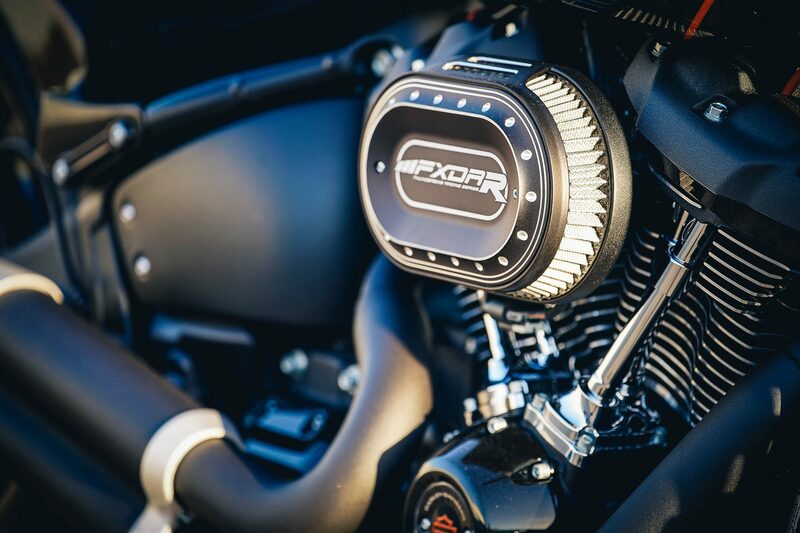 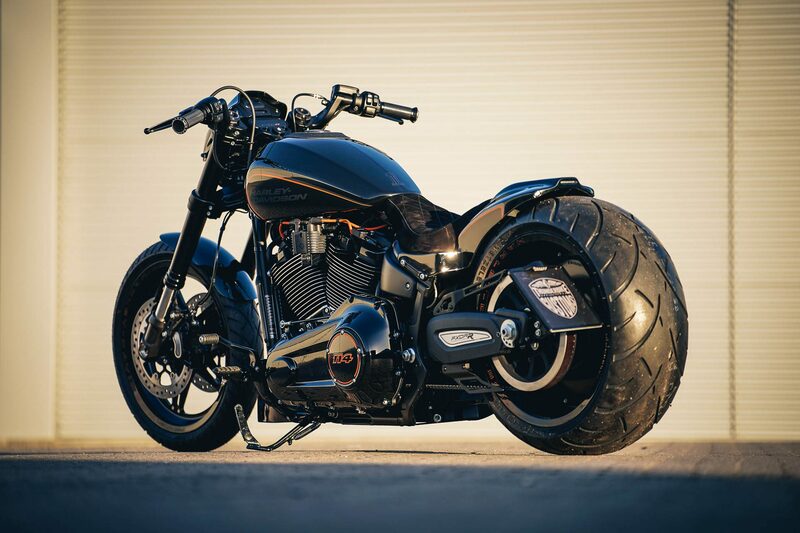 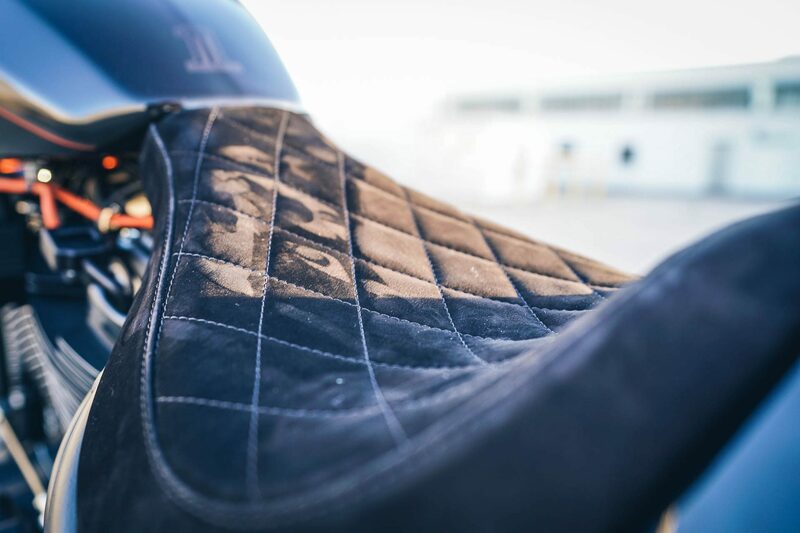 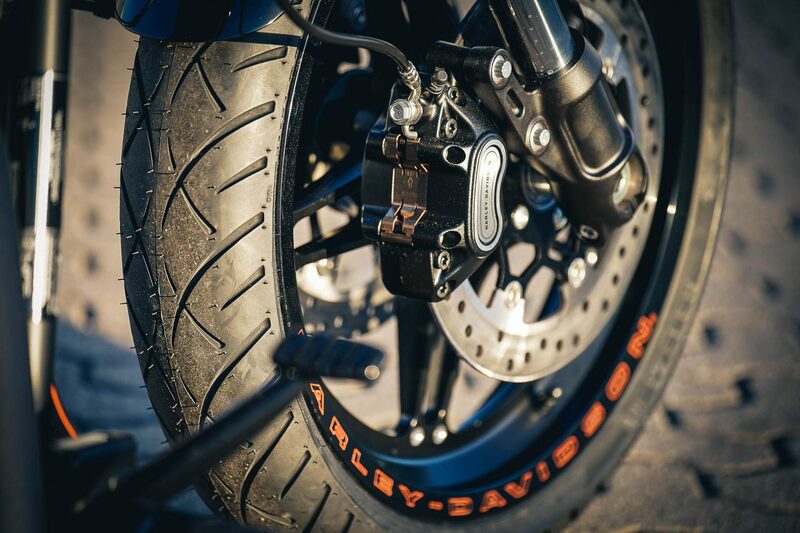 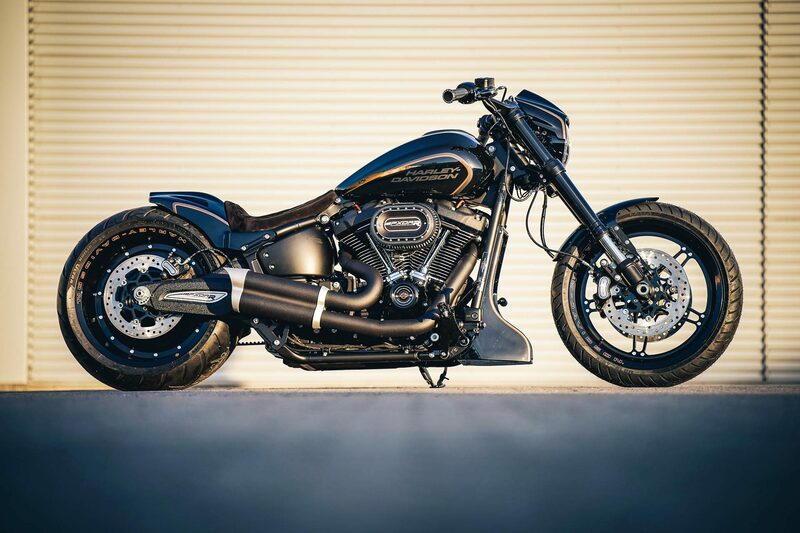 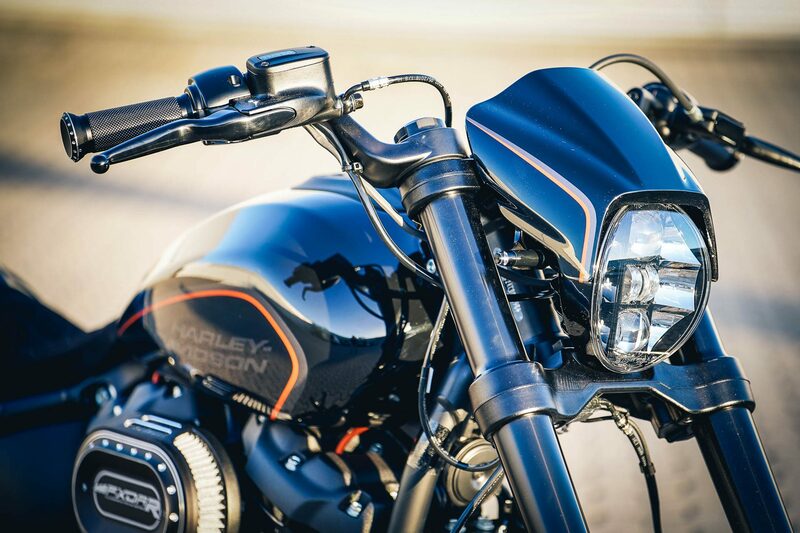 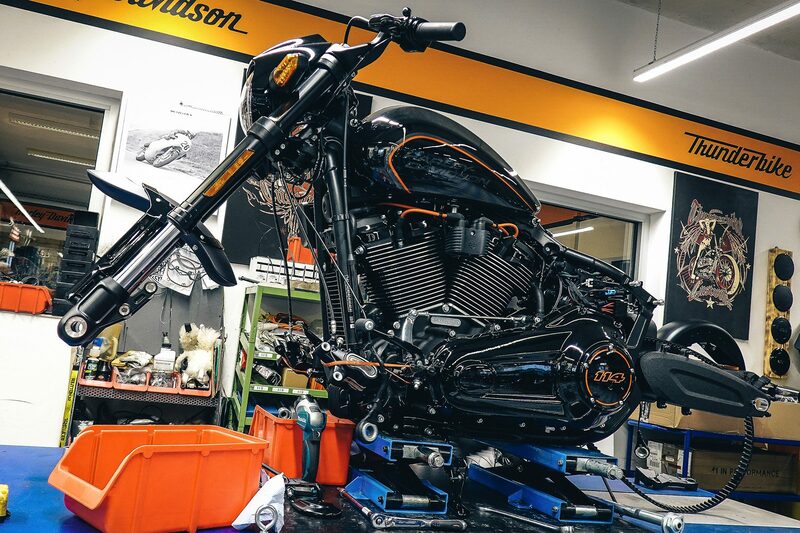 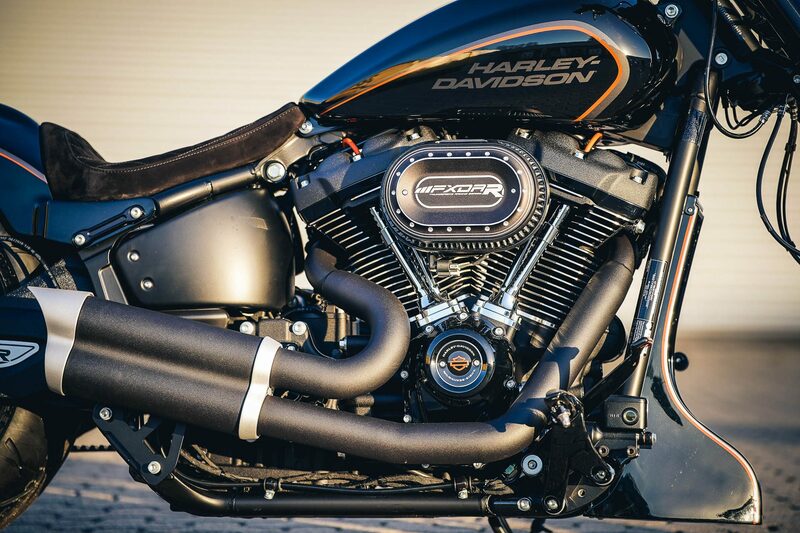 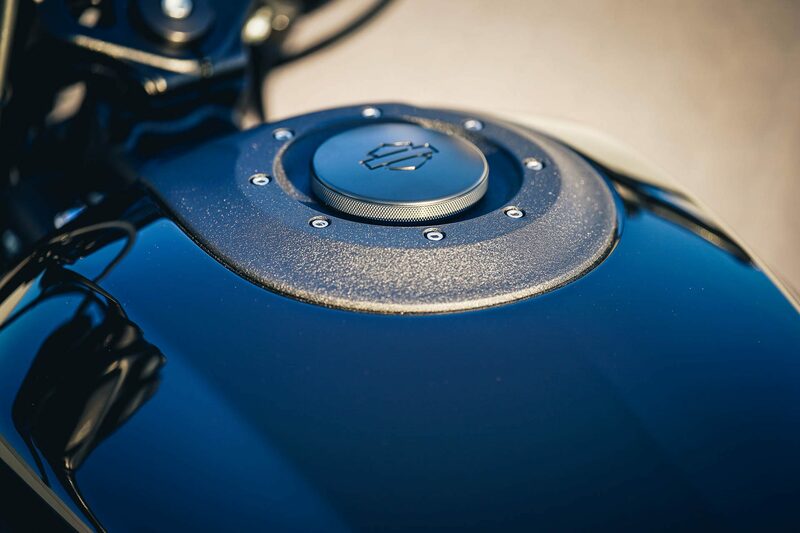 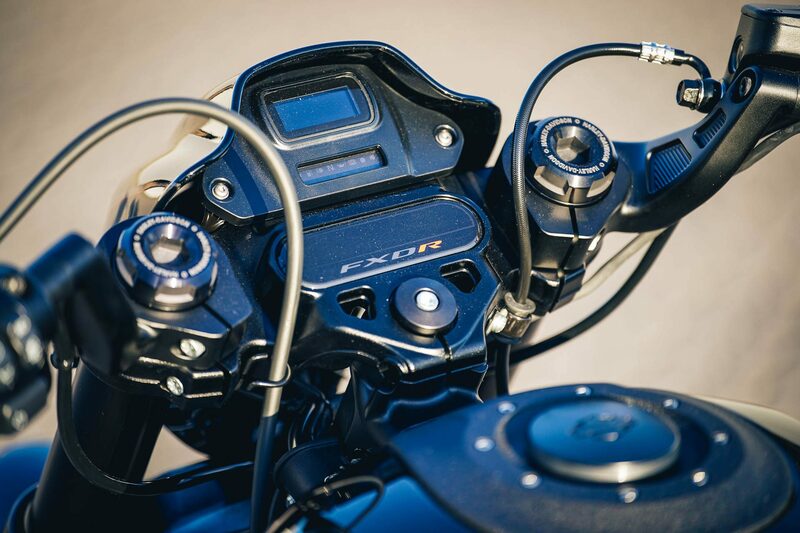 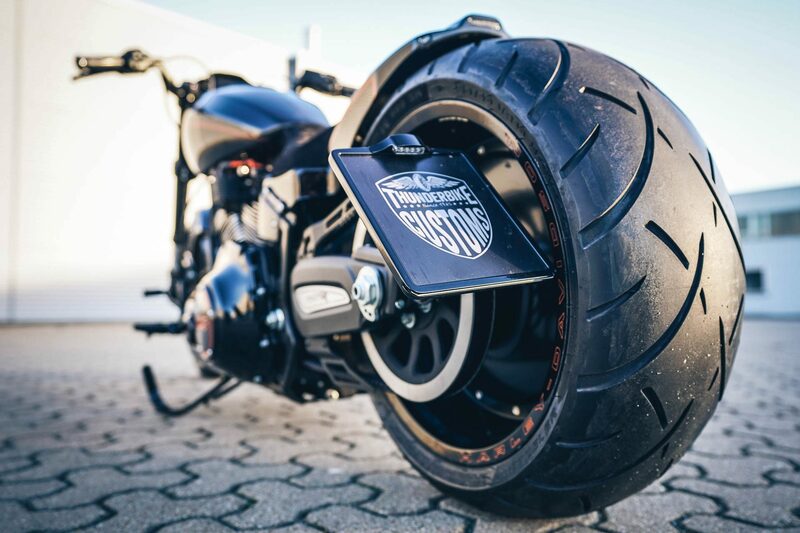 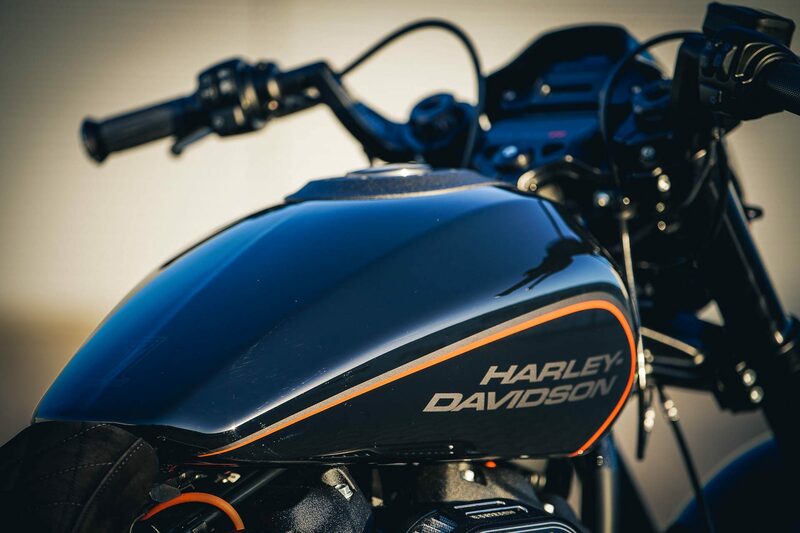 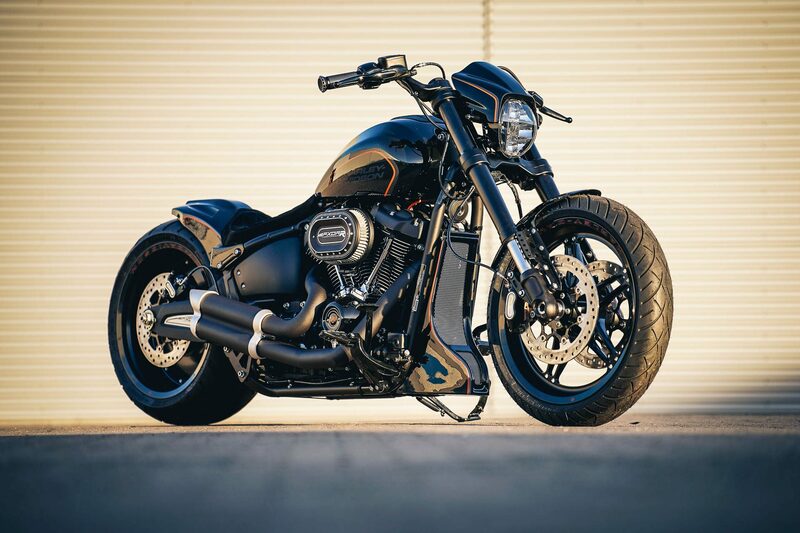 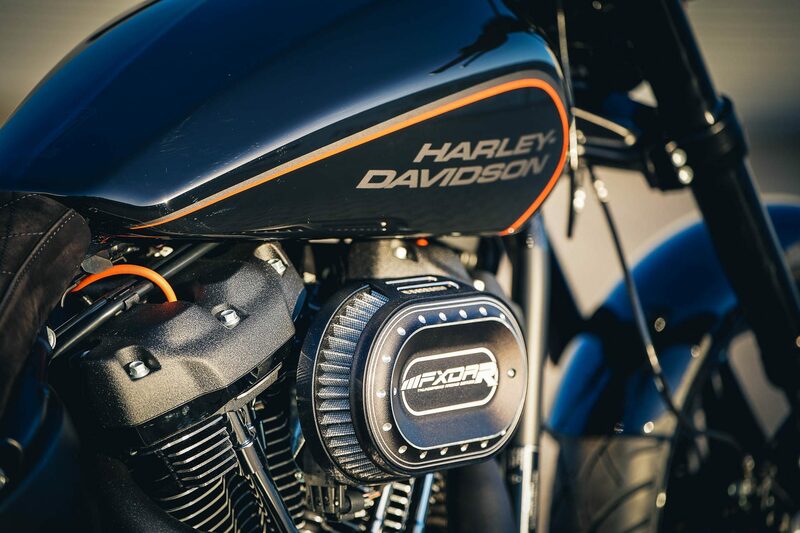 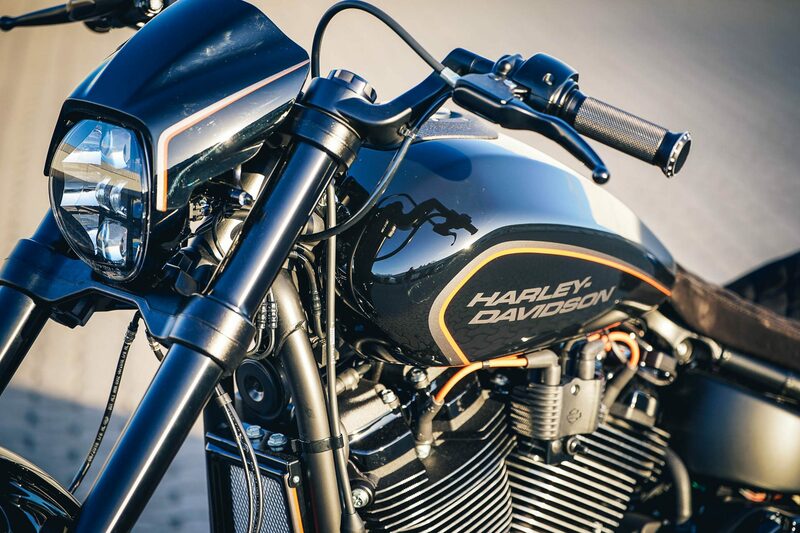 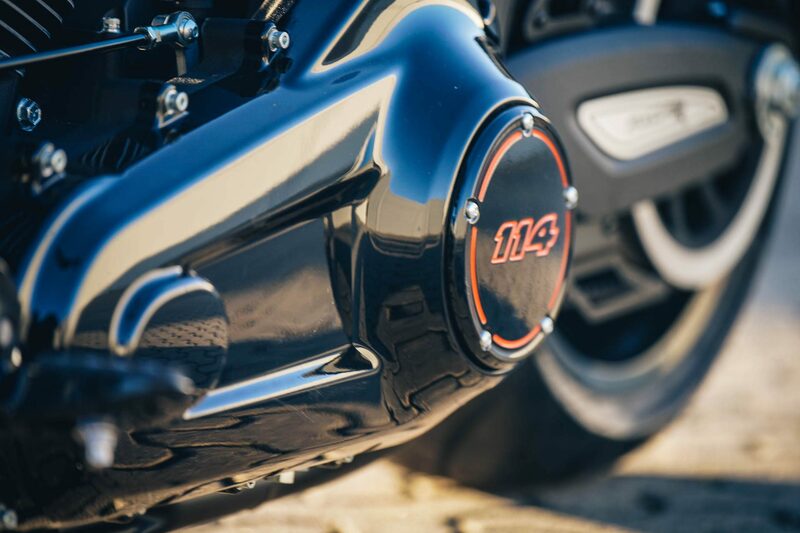 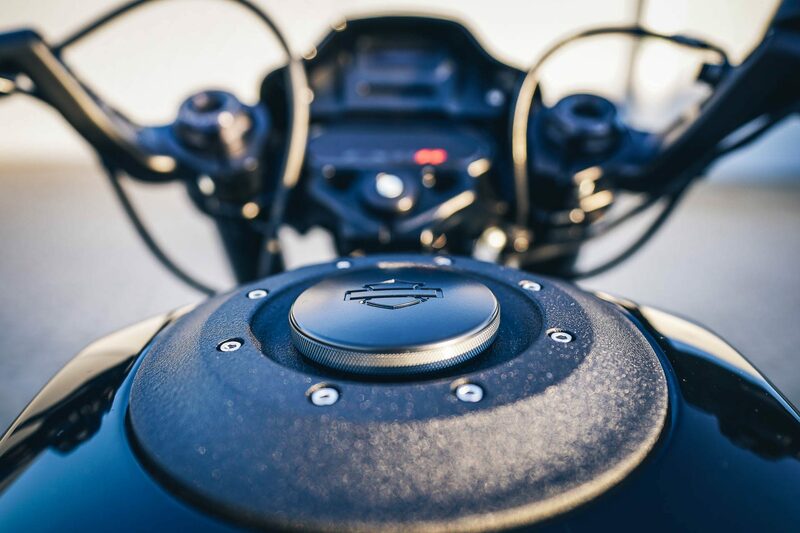 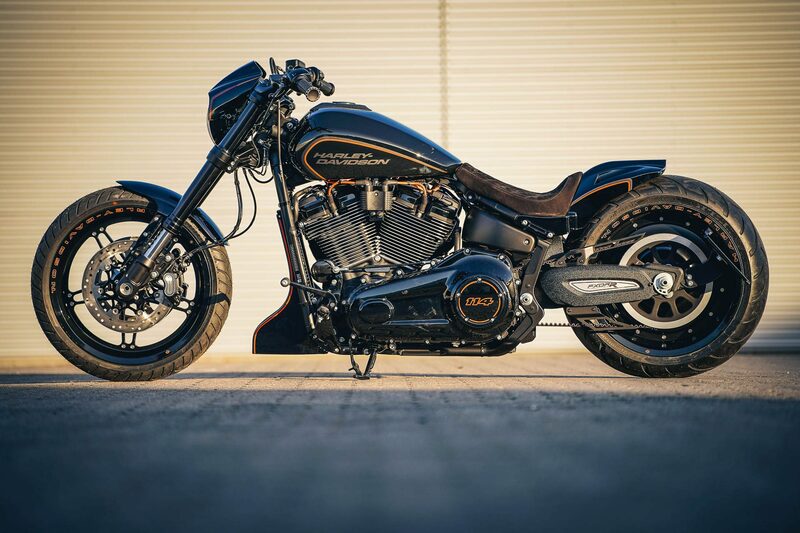 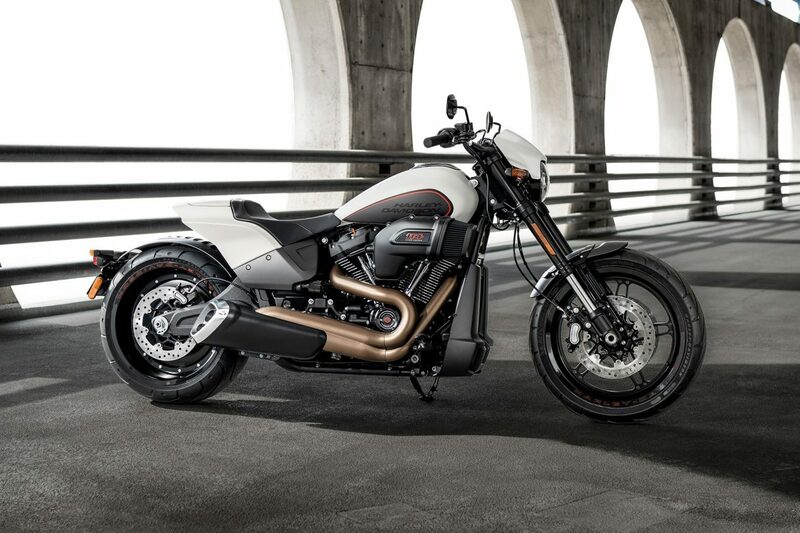 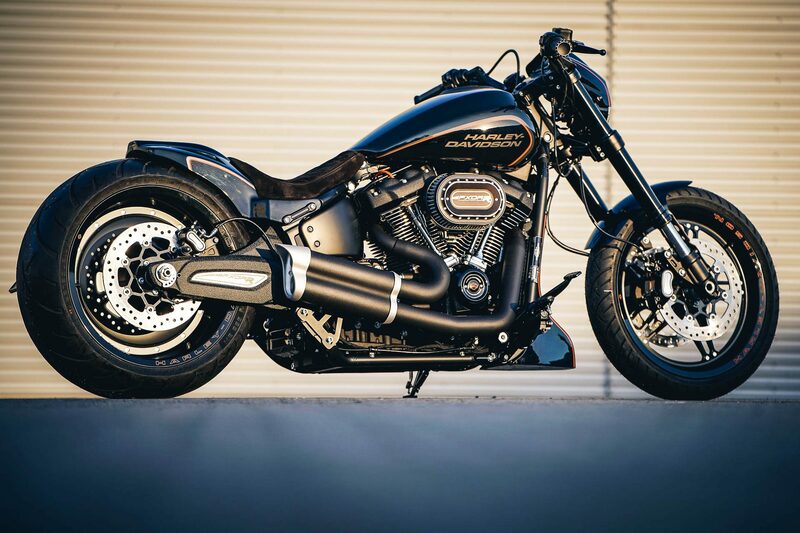 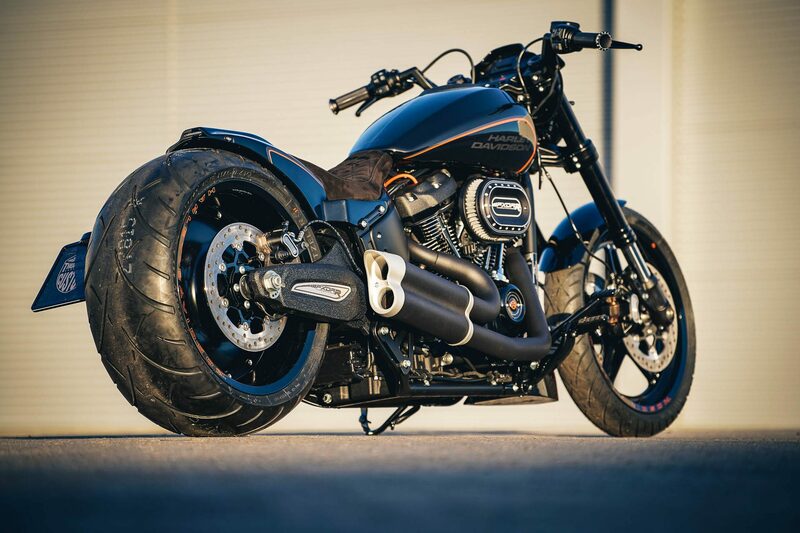 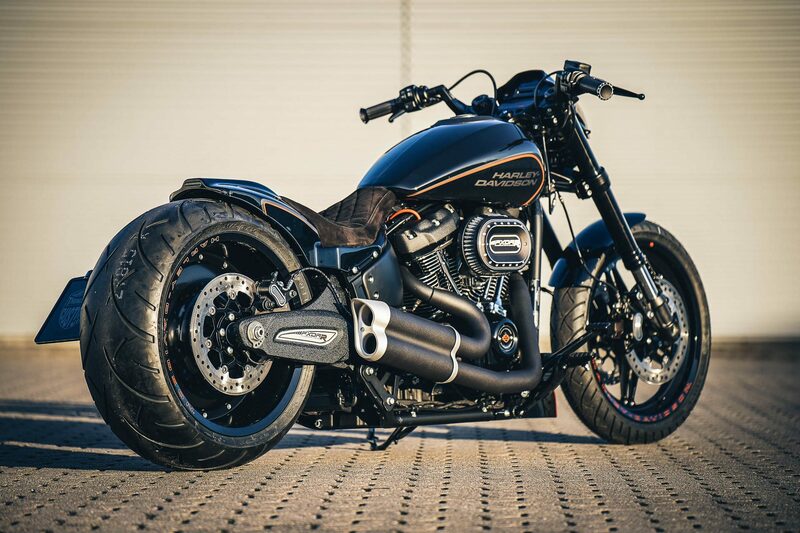 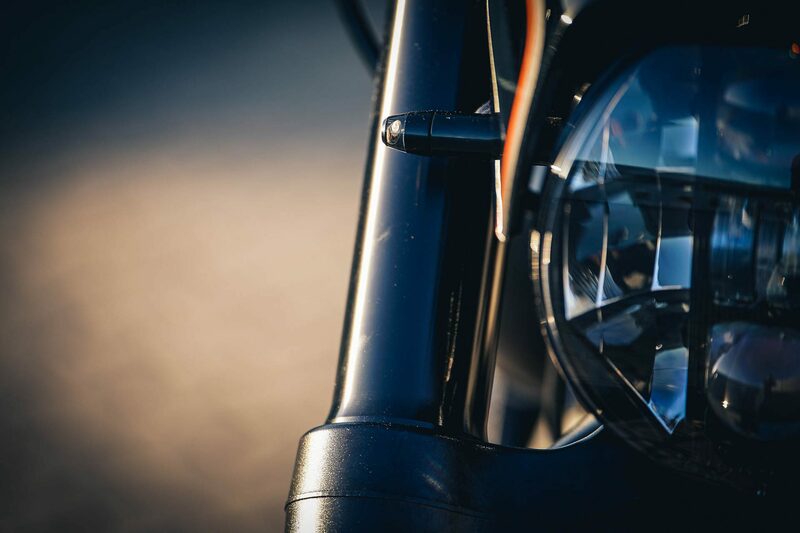 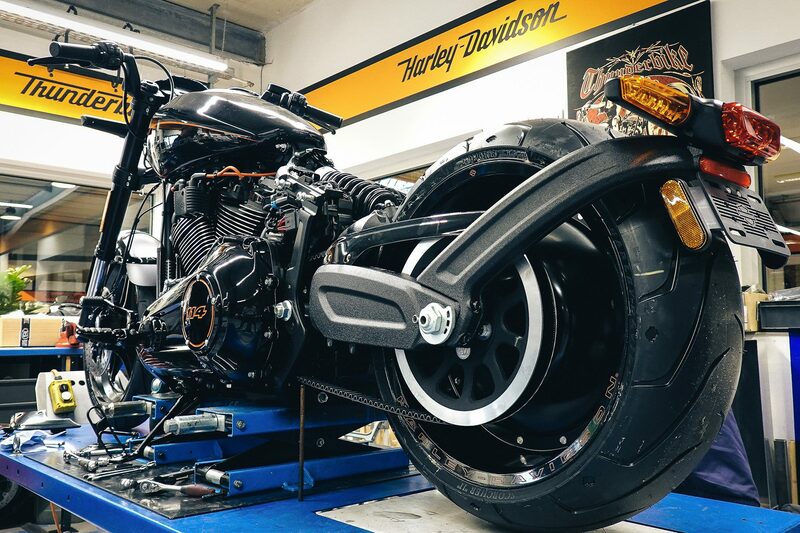 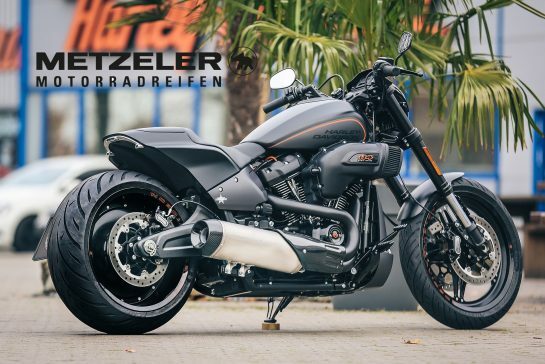 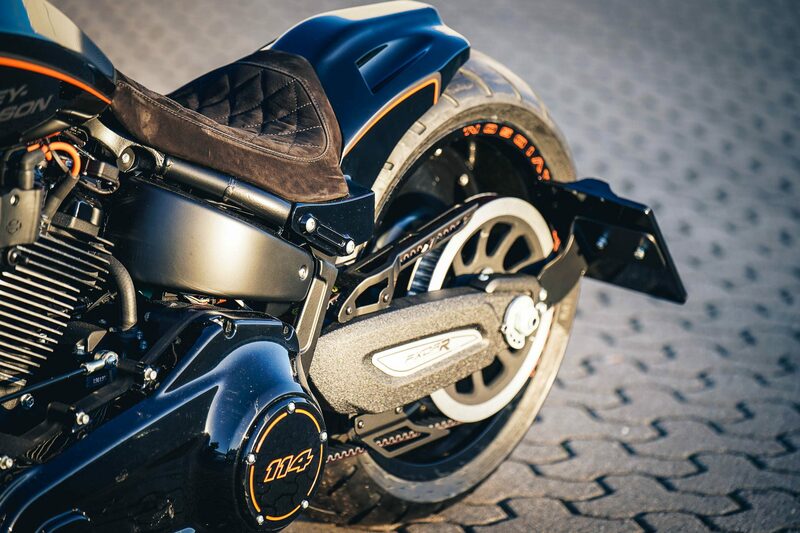 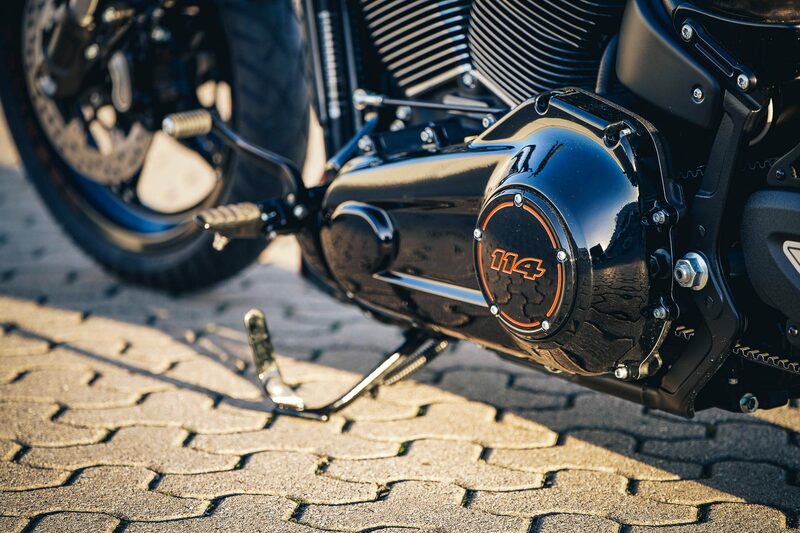 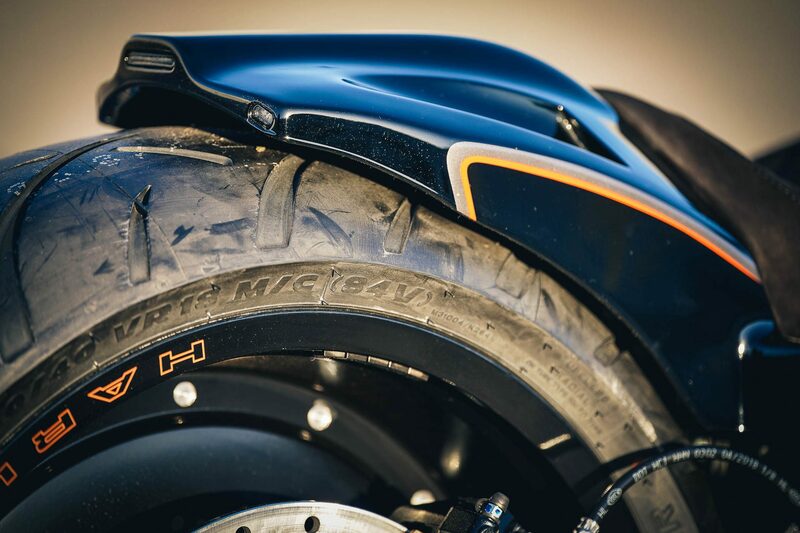 It’s done – the first Harley-Davidson FXDR 114 shines in a new Thunderbike look. 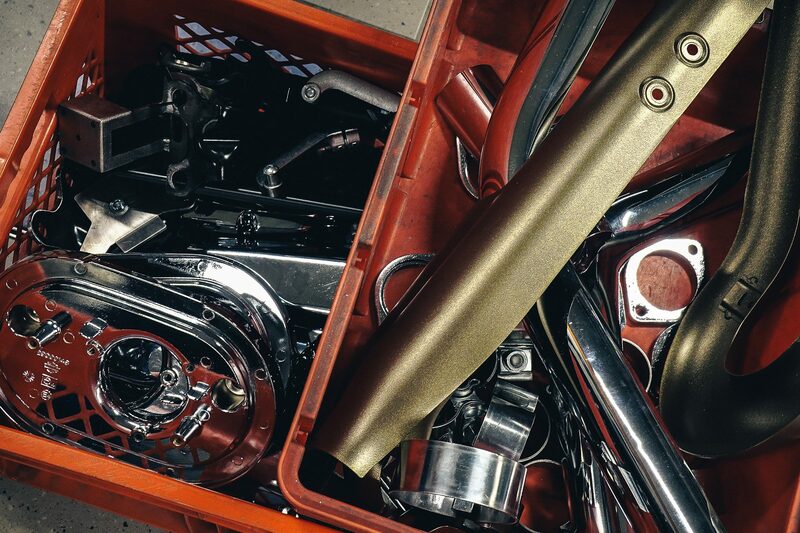 The initial skepticism about what to build from the stock model has quickly turned into a lot of creative fun. 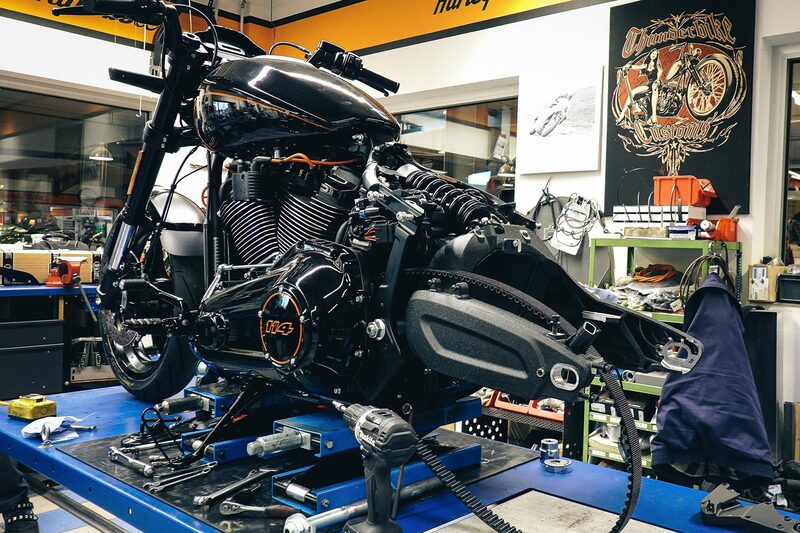 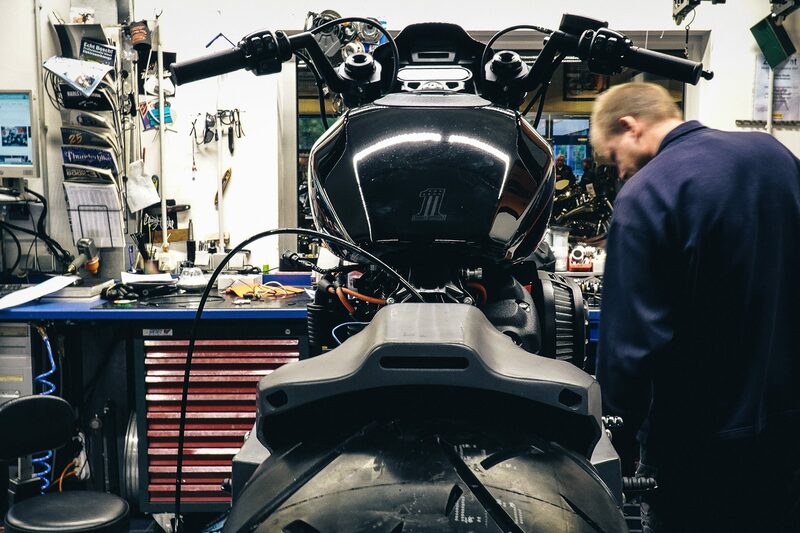 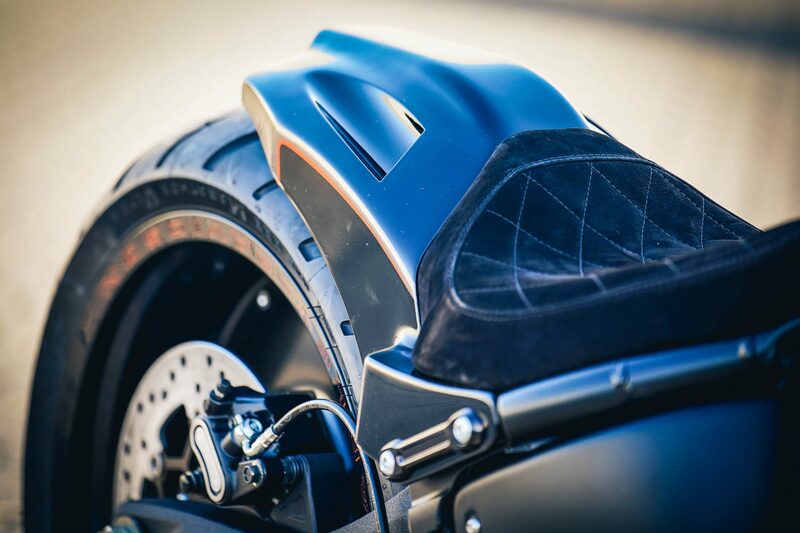 If you look under the bulging fairing-parts of the muscular bike, you will find a wide H-D breakout frame, which we already know very well. 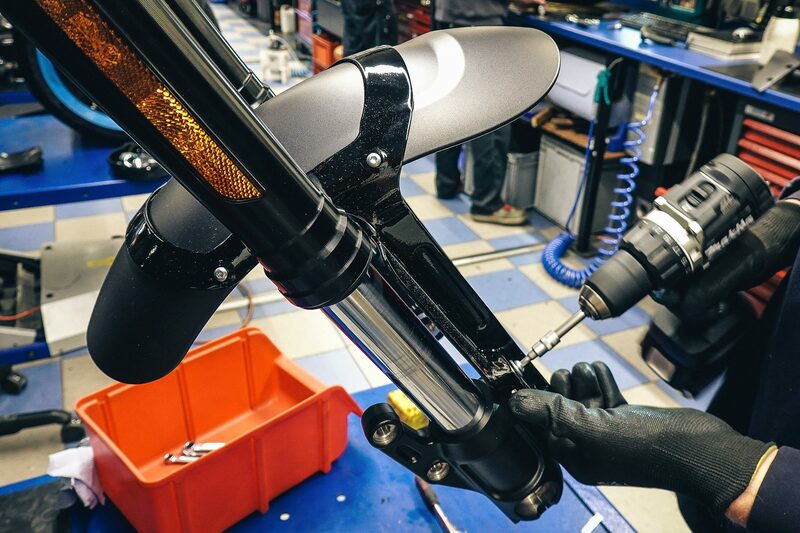 New are swingarm & fork, which required some experiments in the lowering to reach a flat Dragbike look. 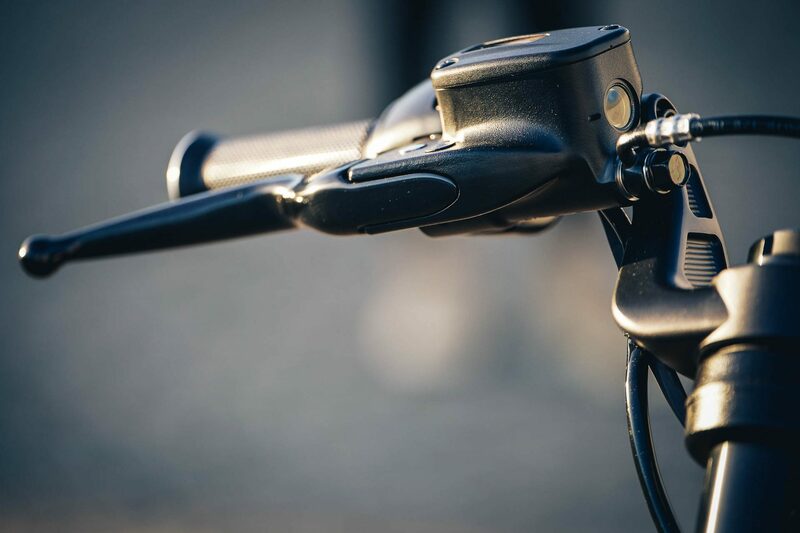 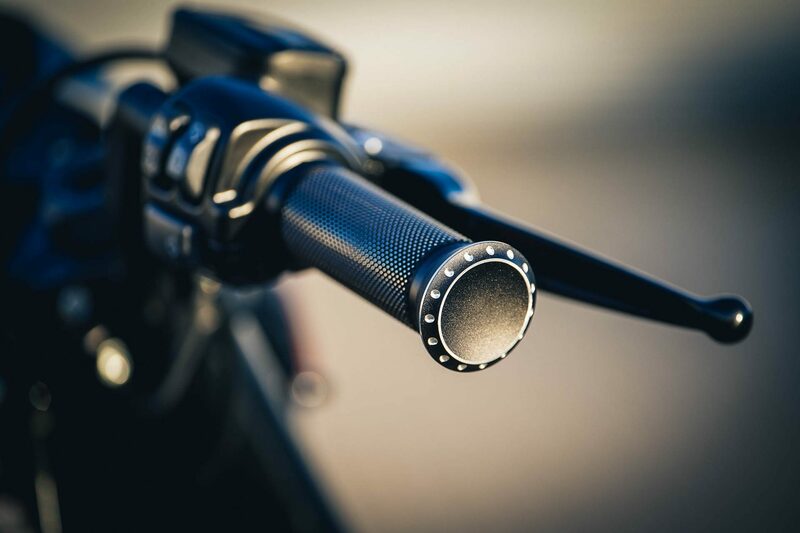 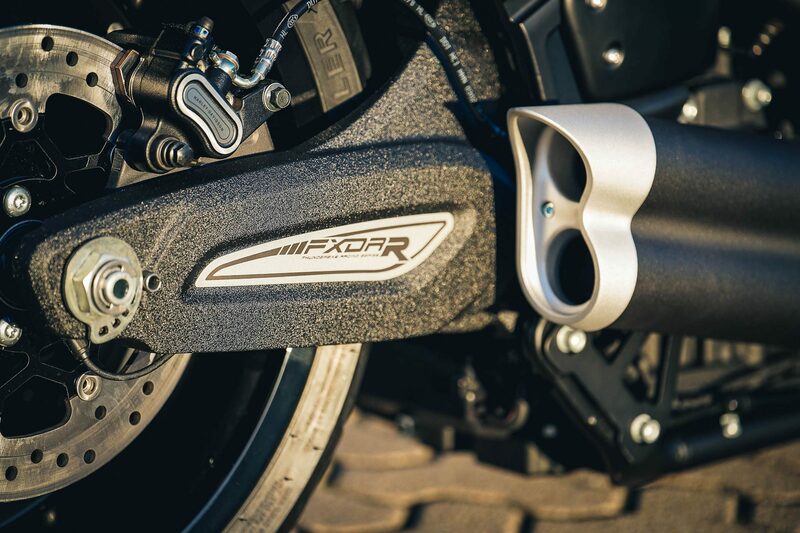 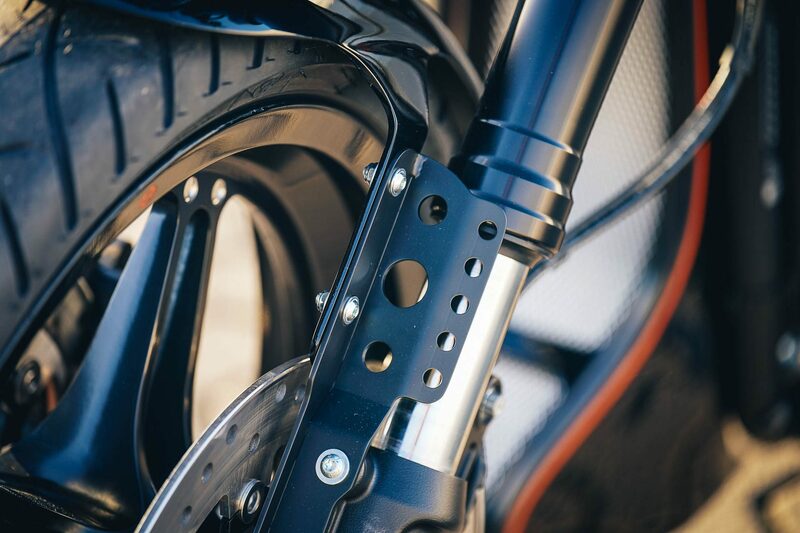 We landed at about 50mm fork lowering for the optics shown here, as the stock FXDR comes a bit higher-legged as a breakout or Fat Boy therefore. 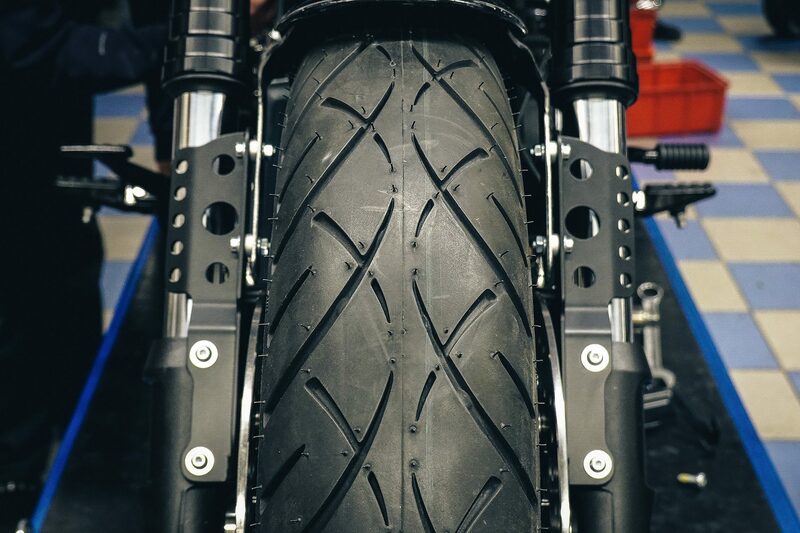 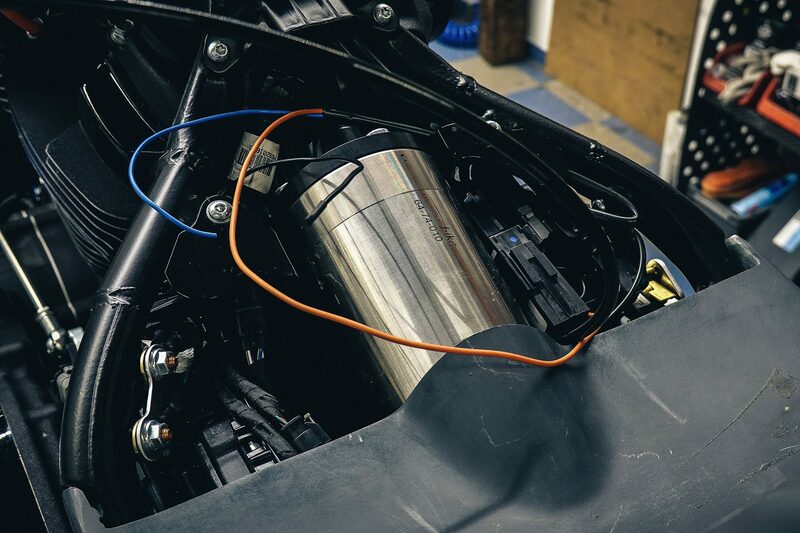 In the back, we solved this problem with our Air Ride suspension, so sporty look on the road can also be followed by action. 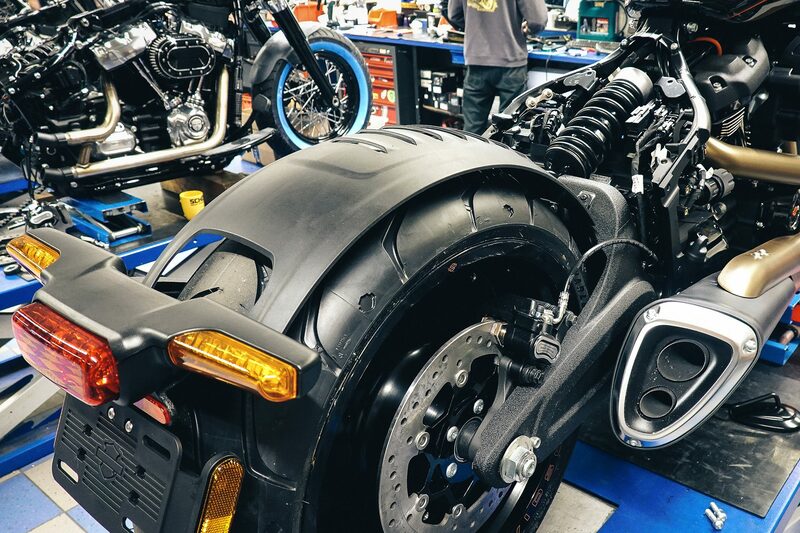 Of course, most of the plastic parts had to go. 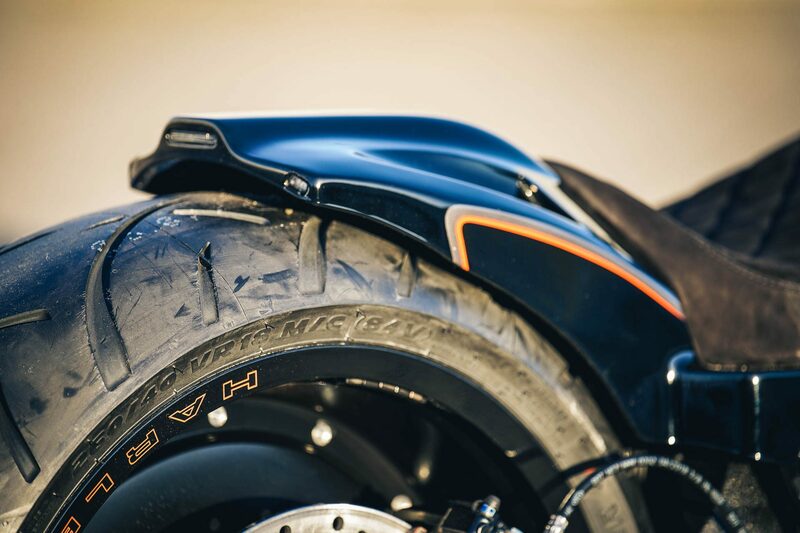 In our case, they simply did not fit into the flat drag racer concept. 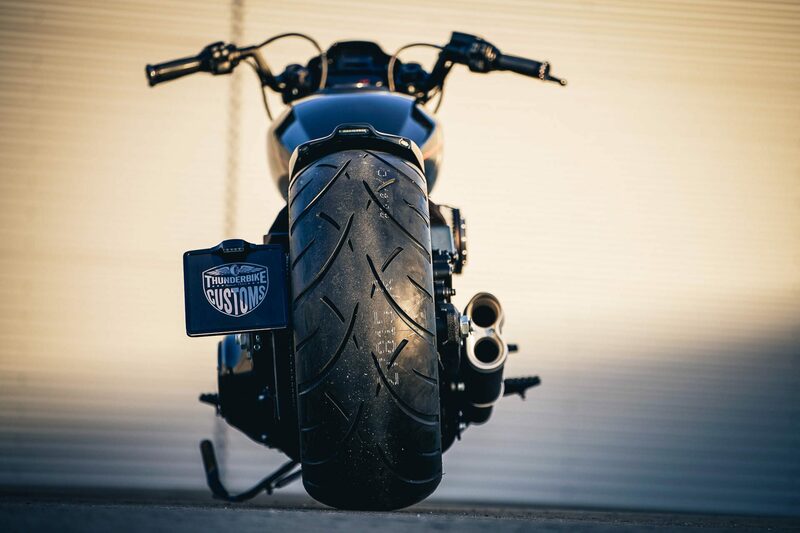 Now it was time to arrange the clean rear-end look. 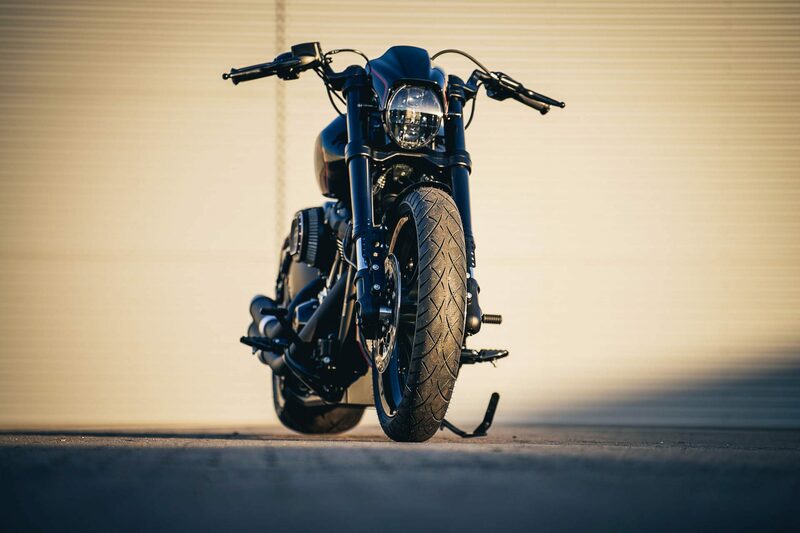 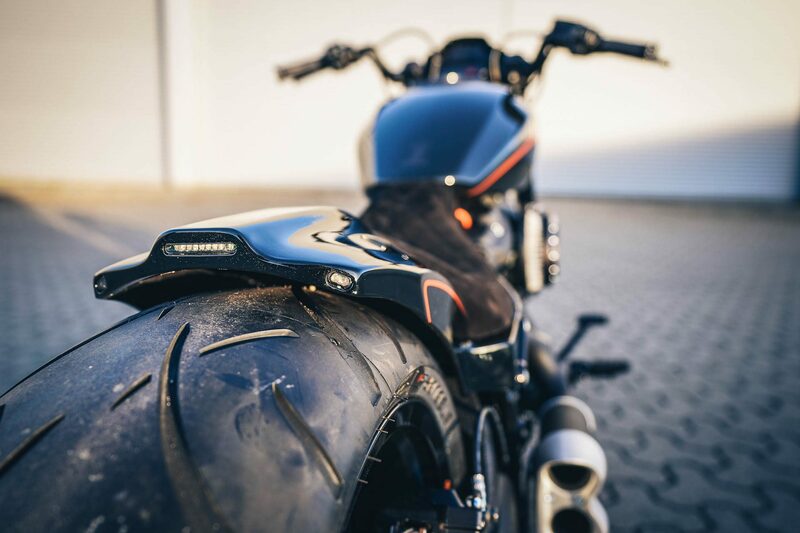 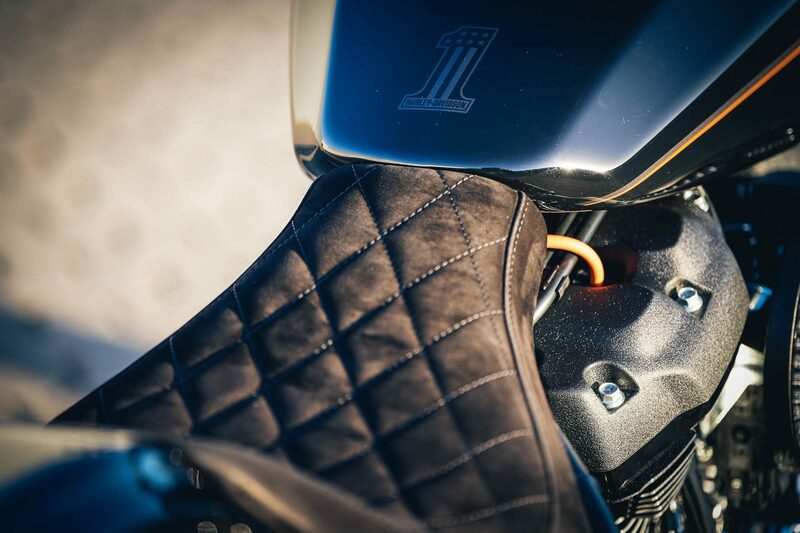 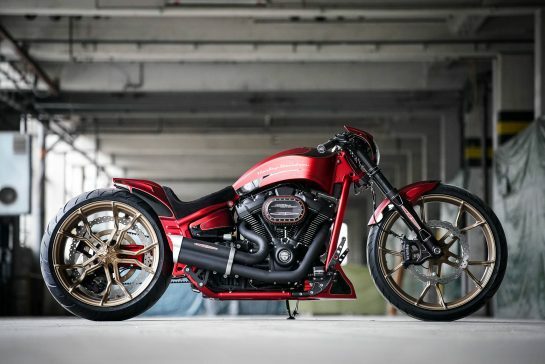 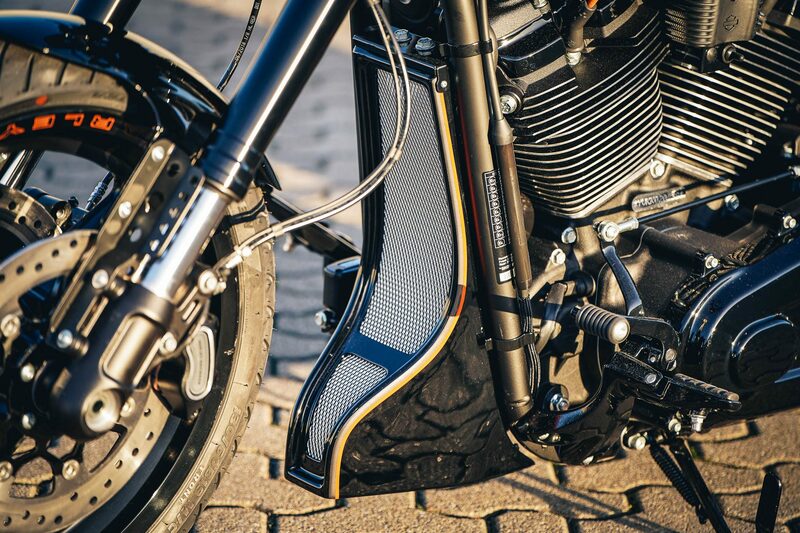 Our GP Style Bolt-on Fender of the Milwaukee Eight Breakout / Fat Boy models, a new seat and the fresh constructed side-mount license plate bracket work wonders here. 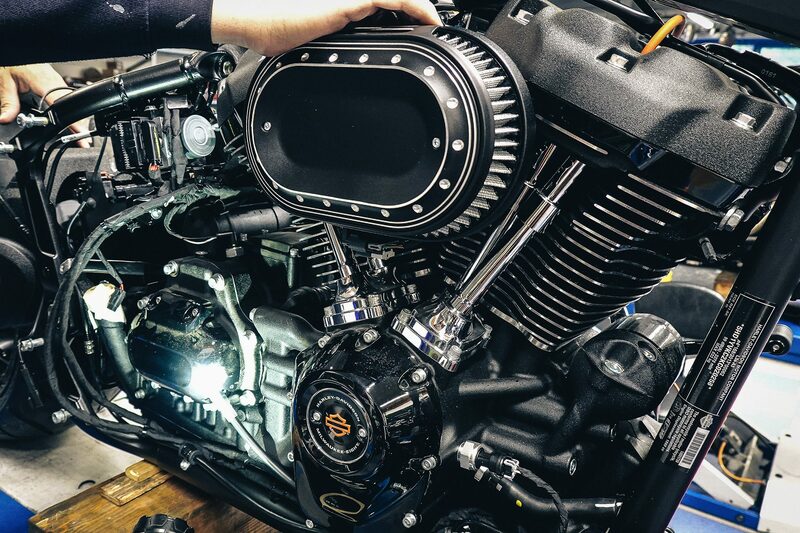 Around the engine a little something had to go, so air filter and mufflers were replaced own versions. 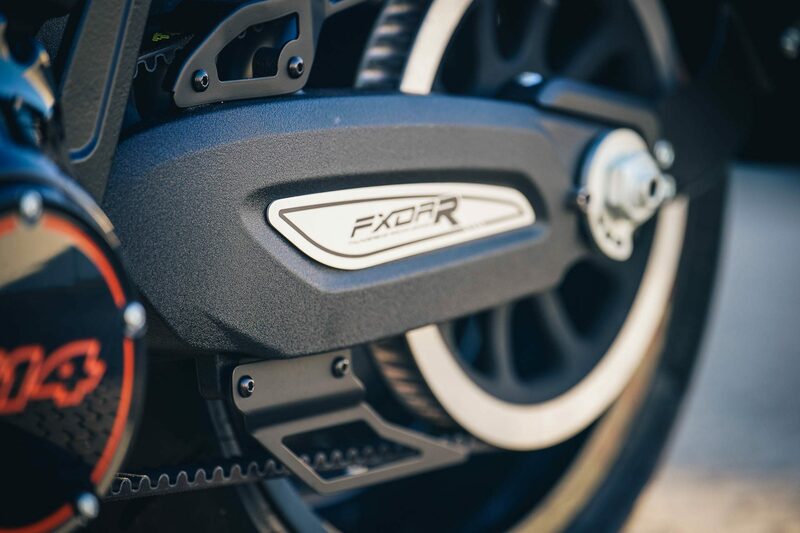 In the end, the FXDR provides a really good base for conversions. 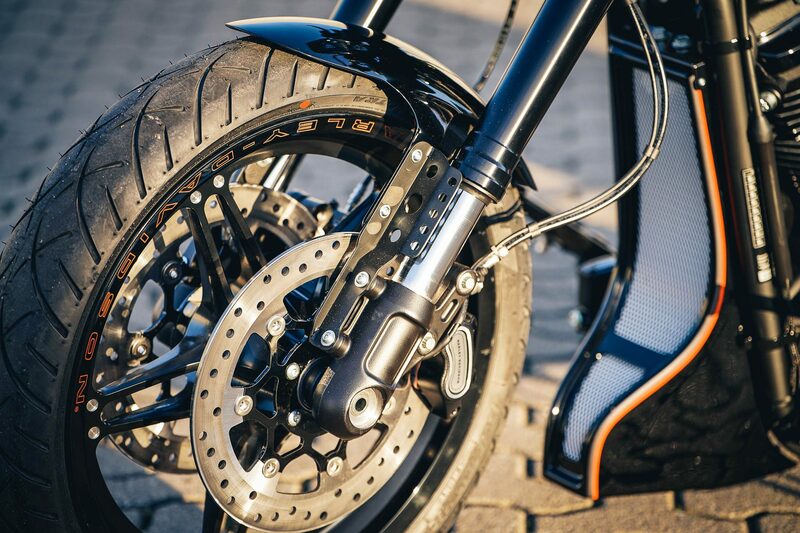 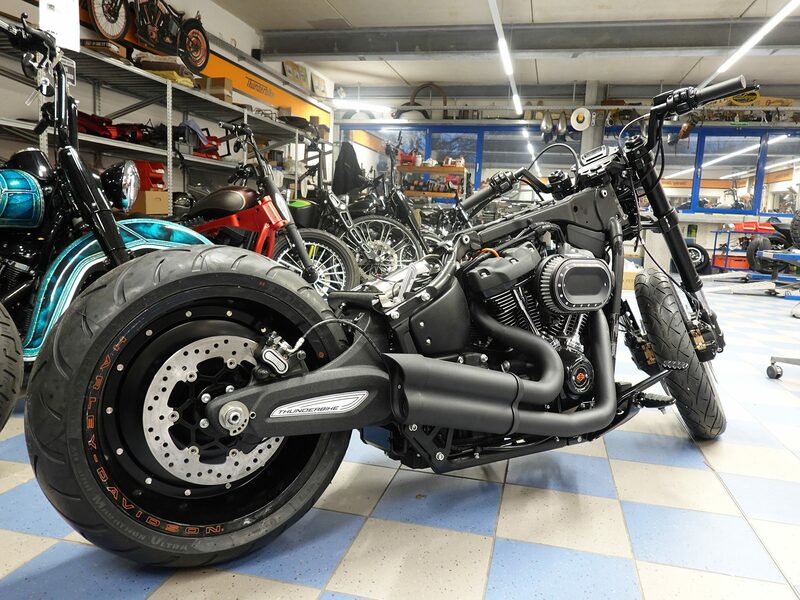 For a few hundred euros extra to a FXBRS (breakout) you get the new swingarm, upside-down fork and double disc front brake. 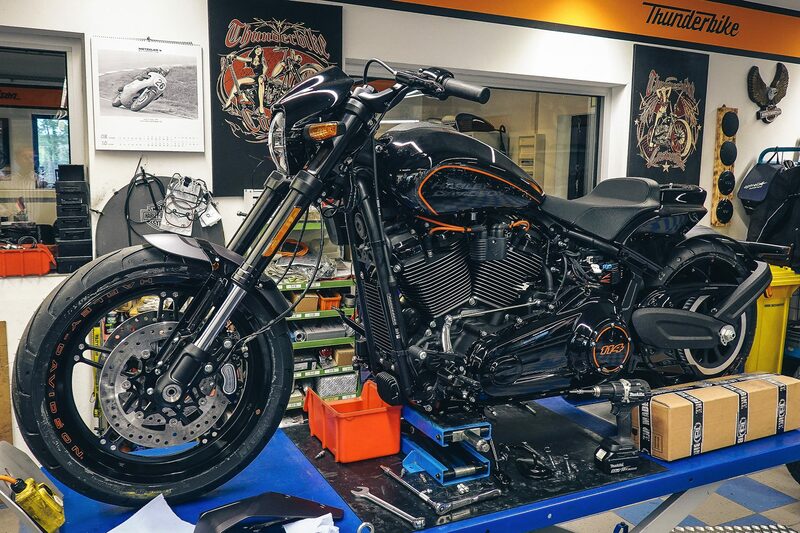 Therefore, we are sure that many more custom conversion will follow. 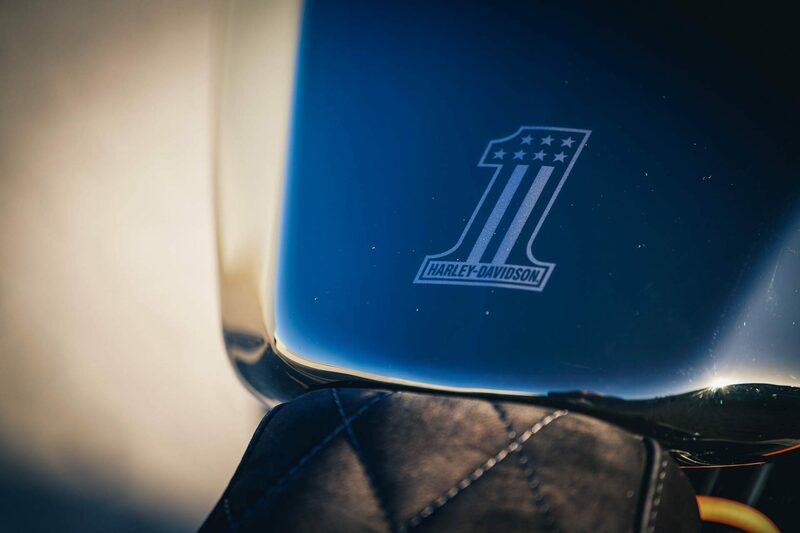 The shown parts that we could not take over 1: 1 will be produced by us in the next weeks.